← slow 5K, But I RAN!! Second Run – On the slow side. So this is the second run since my back injury; I’m taking it slow at the advice of all my runner blogging friends thank you runrodrun, my26pointtwo, paulburton and runsonsyrup. 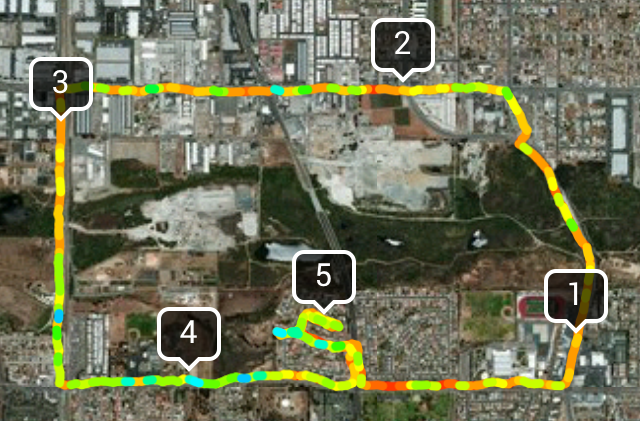 I ran a modified route of one of my normal routes but I kept the hills so that I could get my legs use to them again. I did 5.16 miles (8.3 Km) in 52:08 with and avg pace of 10:06 /mile a bit slow but I’ll take it. This entry was posted in Running, San Diego and tagged 5 mile run, getting better, injured running, jogging, run, running. Bookmark the permalink. 11 Responses to Second Run – On the slow side. Slow running is way better than no running. Glad you’re on the mend! You said that right, I’m thankful that I can run again. Still can’t work on my (non-existent) core yet though. Your ‘slow’ is someone else’s dream pace! What a beautiful home you have. I do not posses a wingback chair but I have something very similar I invested in earlier this year. And everyone knows it is Dad’s chair. Of course, true to form that means I never actually get to sit in it! Good stuff. Slow and easy, mate. Sorry I’m a little late to the party on this! How’s your back feeling Bill? It’s all my26pointtwo fault; He got me on this Pyramid Workout and now my life has been filled with grunts and growns and sometimes multiple ohSH@ts. It will be much harder to return to core then running; these is one thing worse then core training though. Its the jump roping my doctor has challenged me to so simple yet to difficult! The Back is BACK! LOL I should write an I can’ run song I could see it going viral like what did the fox say.